For all the fevered anticipation it generated, director Justin Kurzel’s adaptation of Shakespeare’s masterpiece ‘Macbeth’ seemed to disappear into the mists almost immediately. It’s of little surprise - this is one of the grimmest and darkest films of the past year, both visually and thematically. There’s no respite in it, no light and shade, no chance for the audience to catch its breath. For some, this unrelentingly morose approach and overwhelming sense of style was too much to swallow (and understandably so). However, for those bewitched by its hypnotic magic, this ‘Macbeth’ was one worthy of praise and celebration. Stripping the already taut play back to the bone, Kurzel and his team offer a ‘Macbeth’ more akin to a nightmare than a gritty period drama, moving the audience between moments of brutal realism and carefully composed surrealism. This is an adaptation in the very sense of the word, probably moreso than any film adaptations of Shakespeare in years. The text is a starting point from which to expand and erupt, the extraordinary craft of the film almost more effective at telling the story than the legendary words. What’s of interest here is the dense psychology of these iconic characters and what might be done with them. Taking full advantage of the medium, Kurzel offers us at times surprising and unexpected perspectives on Macbeth and Lady Macbeth, the machinations of their plans and the enormity of their aftermath. This is my favourite of Shakespeare’s plays, and even I found myself intrigued and excited by the decisions made here. Adam Arkapaw’s cinematography is utterly extraordinary, as poetic and rousing as Shakespeare’s text, perfectly complemented by Jed Kurzel’s infernal and phenomenal score. By all rights, both men should have been nominated for Oscars for their work. There’s little to fault technically with ‘Macbeth’, but where it begins to stumble is in the tone of its performances. Michael Fassbender is terrific as Macbeth and Marion Cotillard is breathtaking as Lady Macbeth, but the overall tone of the performances - both leads and supporting cast - is uniformly heavy. Kurzel is mostly at fault with this, seemingly intoxicated by the grimness of the narrative to the point where no light can get in. Even the play itself isn’t as endlessly dark as this film. This is the only serious misstep in ‘Macbeth’, one that prevents it from hitting a proper home run. By the end, you find yourself worn out and exhausted, so hefty is the cinematic assault of the film. It doesn’t surprise me that ‘Macbeth’ wasn’t as loved and embraced as audiences perhaps expected it would be, many perhaps dissatisfied with its unrelenting grimness. That said, I’m still totally in love with it. This great play has rarely been served well either on stage or screen, so the fact that Justin Kurzel offers such a densely fascinating and affecting adaptation of it warrants high praise. This is by no means an easy film to sit through, an elusive and beguiling serpent, but once it bites you, it’s impossible to shake its poison from your system. I suspect I’ll be revisiting this one endlessly for many years to come. Justin Kurzel offers such a densely fascinating and affecting adaptation. Transmission have given ‘Macbeth’ a gorgeous 1080p 2.40:1 transfer to Blu-ray that honours Arkapaw’s stunning cinematography. This is overall a very dark film visually, yet the transfer captures all the detail without compromising this. Colours are rich and leap from the screen. The DTS-HD MA 5.1 track is likewise excellent, clear and powerful with the dialogue and score beautifully balanced. Overall, this is an excellent high definition presentation of this visually and aurally thrilling film. The only extra on offer is the featurette ‘Bloody, Bold and Resolute: The Making of Macbeth’ (12:20), which features all the major players of the film discussing the psychology of the characters and the process of adaptation. It’s a pity we don’t have more substantial material or an audio commentary, but there’s tidbits of interesting information here that help enrich your understanding of their artistic intentions. The 'Macbeth' competition has now closed. Winners will be announced shortly. Competition opens at 5pm AEDT on Sunday 7th February 2016 and closes at 11:59pm AEDT on Sunday 14th February 2016. Five winners will be chosen at random on Monday 15th February 2016. To successfully win, entrants must fulfil the above entry conditions before the time the competition closes. Current members/followers are eligible to enter the competition. Only one entry per person. Only one winner per household. To be a valid winner, the entrant must not have won a prize from SWITCH within the last 28 days. Each winner will receive one Blu-ray copy of 'Macbeth'. By entering, you agree to receive occasional emails from SWITCH in the future. If you decide to unsubscribe from these updates, any further entries will not be applicable. Only Australian residents are eligible to enter. 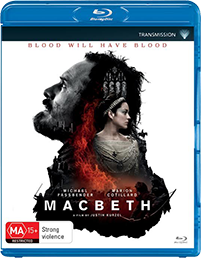 'Macbeth' is available on Blu-ray, Digital Download and DVD on Thursday the 11th February 2016 from Transmission.